I have a preamble for the Top Ten Supergirl Comic moments of 2016 yesterday when I covered #10 through #6. As I said then, this was a great year for Supergirl in comics. It took me a while to sift through everything to come up with this list. And I had a hard time picking the number one moment for the year. As always, I love dialogue so please let me know if you think I missed something, put something in a wrong ranking, or was just plain nuts. Without further ado, here they are, the top five comic moments for Supergirl in the year 2016. There were plenty of moments in Adventures of Supergirl that could have made this list. Sterling Gates has such a respect and love of the character that you just know you are going to get a great, high quality read. Gates respect for the character's history was evident in AoS chapter 7. 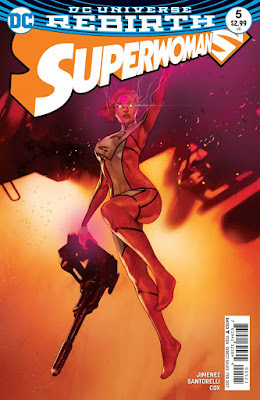 The main villain was classic Supergirl nemesis Psi, And in the story, Psi batters Supergirl's psyche with dream visions. I absolutely loved how Gates acknowledged all the different incarnations of Kara in this psychic attack. Earlier we saw the New 52 Kryptonian armor, got Nightflame name-dropped, and heard of Supergirl sporting flame wings. 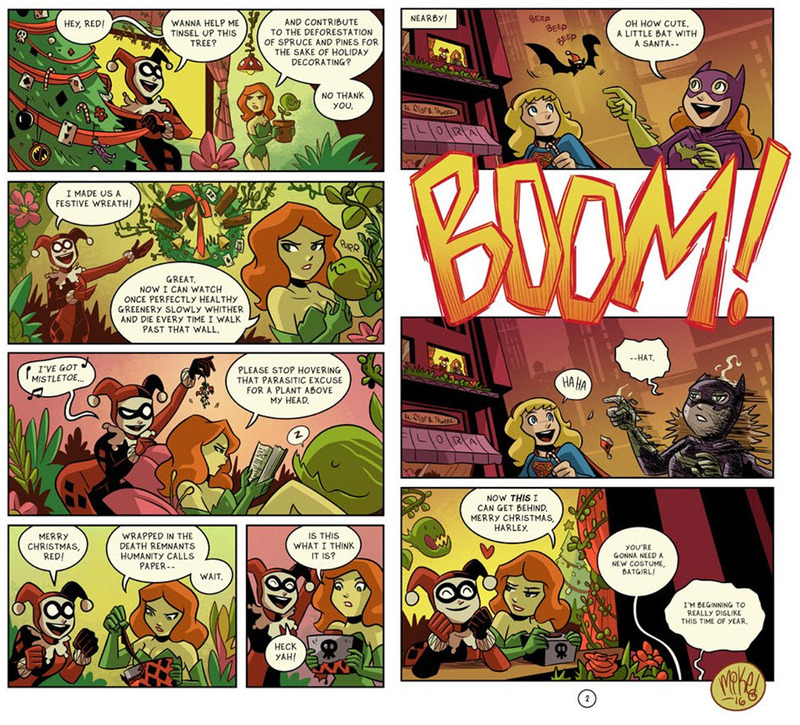 Here, lusciously drawn by Emanuela Lupacchino, we see Supergirl fighting the Timm-verse version, the Red Lantern Kara, and even the 'pink Halloween costume' Supergirl. Having a writer like Gates recognize the importance of the character's diverse and long comic history was just fantastic. When I read this, I thought for sure this would be in the top 3 moments of 2016. We are nearing the end of my Best of 2016 posts, looking at the back half of the Top Ten Supergirl Moments in Comics this year. Unlike some years, there was plenty of great moments to pick from which means plenty of comics that Supergirl appeared in! In fact, looking at this list, there are moments from 7 different titles. That's pretty incredible. And, as is typically the case, I had a very hard time picking the #1 moment. The top two moments flip-flopped in the top two slots in my mind so many times I thought I should label them 1a and 1b. But that felt like cheating. So I had to put my mind to it and just choose. Lastly, I always ask that folks let me know what you think of the list. Is there a moment I completely missed? Is the order wrong? Should something else be number one? And what are your thoughts of the year in total for Supergirl. Welcome to the first in three Best of 2016 posts focusing on the best comic moments for Supergirl over the last year. I found it hard to stick to just the top 10 moments because there was a lot to love in the comics this year. I will admit this year opened up a little odd for Supergirl in comics. 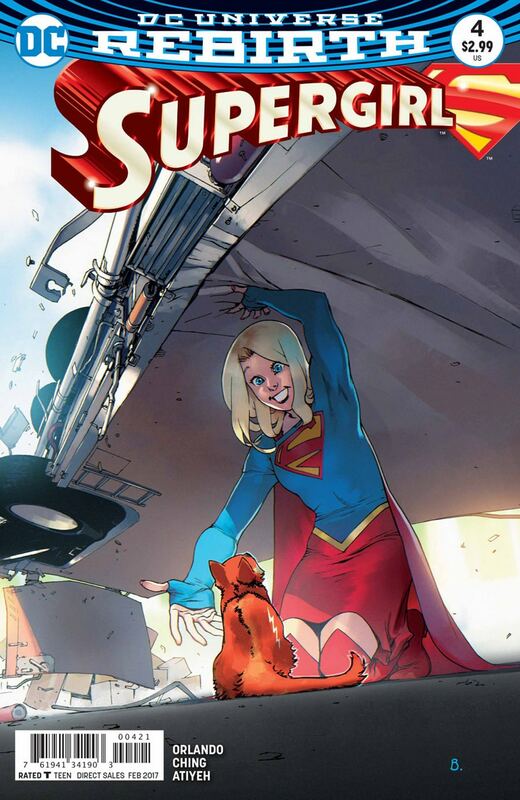 With her popularity peaking in the non-comic world, 2016 opened up with no comic titled Supergirl on the shelves. The majority of the year, we had to read Supergirl in comics that were on the periphery of DC Continuity. She led the team in JL3001. She fought Nazis in DC Bombshells. She existed in a universe based on the television show in Adventures of Supergirl. It wasn't until the summer and The Final Days of Superman that we saw Supergirl in the main DCU. But then #Rebirth happened and we got a new Supergirl title. So please read on to see my 'almost the best' comic moments for Supergirl in 2016! 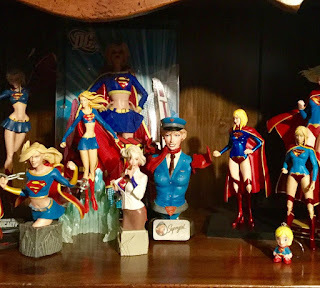 Welcome to the first of four posts reviewing the year 2016 for the character Supergirl. This is the ninth time that I have done a year in review for this site and they are some of the more difficult posts to put together. Sometimes they have been joyous, a chance to look at how great the year has treated Supergirl. Sometimes it has been frustrating. Some years I have put together a 'Worst of' List. For me, the last couple of years have really been a time for celebration. Between a new direction in the comic and a Supergirl show making her part of a popular culture, it seems like the character has had a true chance to shine. 2016 might be the overall best year for this character since this blog started. And that is amazing. Because when I started this blog 8 years ago, if you asked me if I believed that any of these upcoming moments would happen in my lifetime I would have said no. 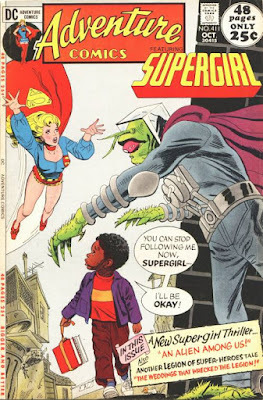 The focus of this blog has always been the comic character of Supergirl. Today I will focus on the best non-comic moments of 2016. Obviously, the biggest non-comic event for Supergirl in 2016 was her prime time major network television show. Last January we were in the middle of her first season over on CBS. We got a Supergirl version of 'For the man who has everything'. 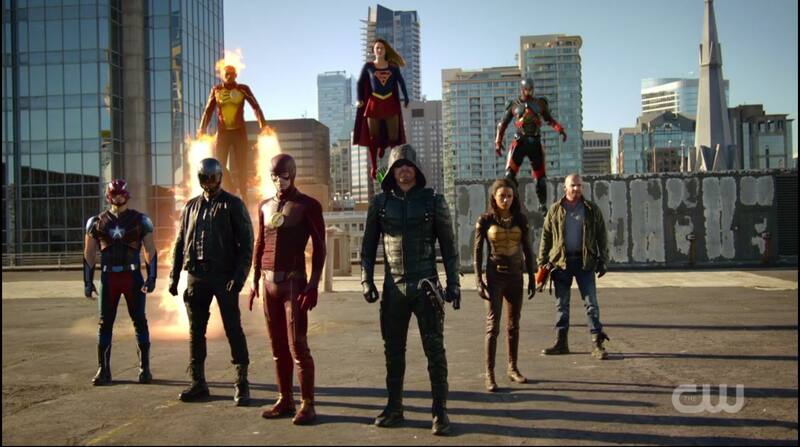 We got a network crossover with the CW star The Flash. And we had a solid ending to a first season with Kara rejecting the evil actions of her home planet Krypton, embracing Earth as her home. It wasn't perfect. But Melissa Benoist was as close to perfect as you can get. She *was* Supergirl. And the show understood everything that is great about the character. For a while, the future of the show was unclear. I actually worried that we wouldn't get more. But then we got what was, in the end, probably the best of all worlds. The show moved officially to the CW. The show runners hit the ground running. Suddenly Supergirl was everywhere, poster, magazines, and commercials. We got a Supergirl/Superman crossover with the best media representation of Superman in years. The cousins were familial and supportive of each other. We got the tremendous storyline of Alex Danvers coming out. Those scenes by Chyler Leigh were simply incredible. And we got a deeper dive into the super-universe with supervillains and the Luthors running around National City. All incredible. And then, perhaps a thumb in the eye to the grim, gritty, oppressively gray DC cinematic universe, we got an Invasion crossover and a real life Justice League working together to stop aliens. Look at that picture and tell me that this year wasn't great for Supergirl (and DC overall) on the small screen. 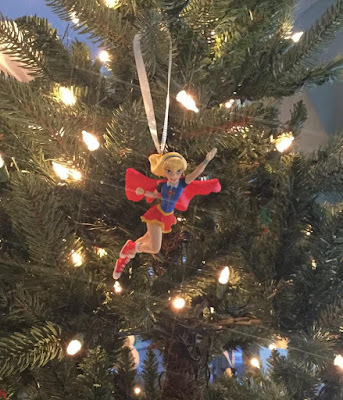 There was a surprise Christmas gift under the table for everyone late last week when Mike Maihack released a Supergirl/Batgirl Christmas comic. This year there was an added bonus ... Harley Quinn and Poison Ivy. There is a little bit of mirroring in the two relationships. Harley is the happy-go-lucky, super-festive, silly one trying to get Ivy to sprout a smile and get into the holiday mood. And Ivy is all so serious, looking at all the dead plants around her in the form of wreaths and wrapping paper. We have seen this silly/dour yin/yang back and forth between Kara and Babs in all of Maihack's prior strips. So seeing it played out here was fun and made me hope that we see more interaction between these four in future comics. Finally, Harley gets Ivy into Christmas. 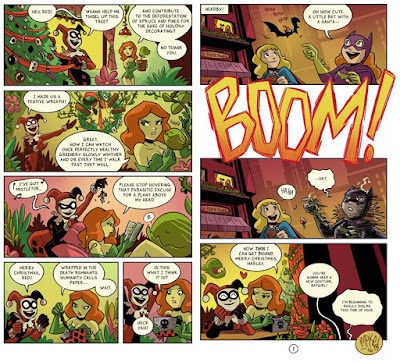 She lets Pamela detonate a bomb in Batgirl's face in the style of a Looney Tunes cartoon. And the delivery mechanism .. a santa-hatted bat ... is brilliant. But (and I know I am biased) my favorite bit is Kara laughing when Babs gets blasted. It is a funny moment. So drain the last bit of egg nog and enjoy this treat. And thanks to Mike Maihack for continuing to bring joy to the world. Hope everyone has a great season! We are basically nearing the end of the holiday season with Christmas around the corner and a New Year following right behind. 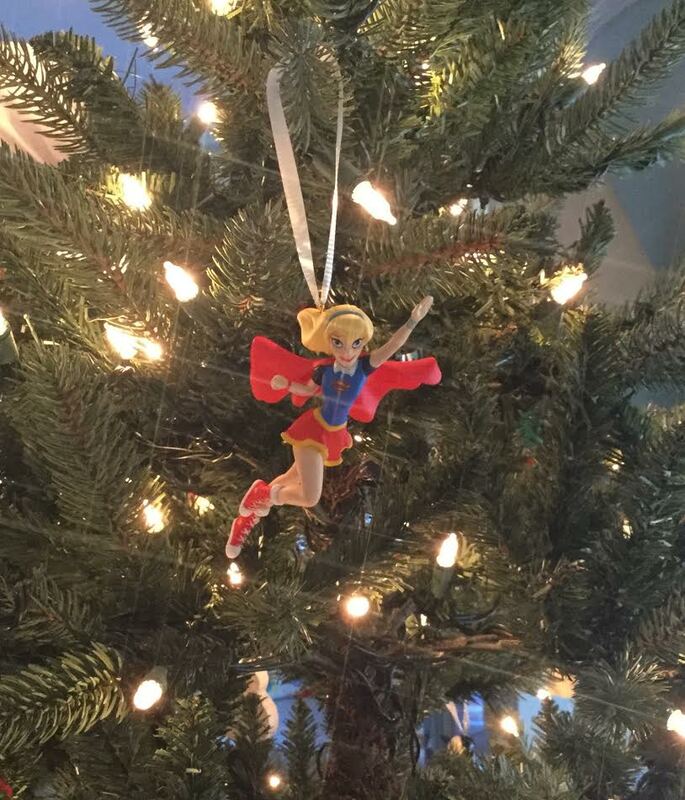 One thing that I have been pleased to note this year is how Supergirl is represented in gifts and holiday decorations this year. I am still amazed that Supergirl has become such a huge pop culture presence. For me, these last couple of years, every day has been Christmas. Just incredible. Let's start out with the item that floored me. 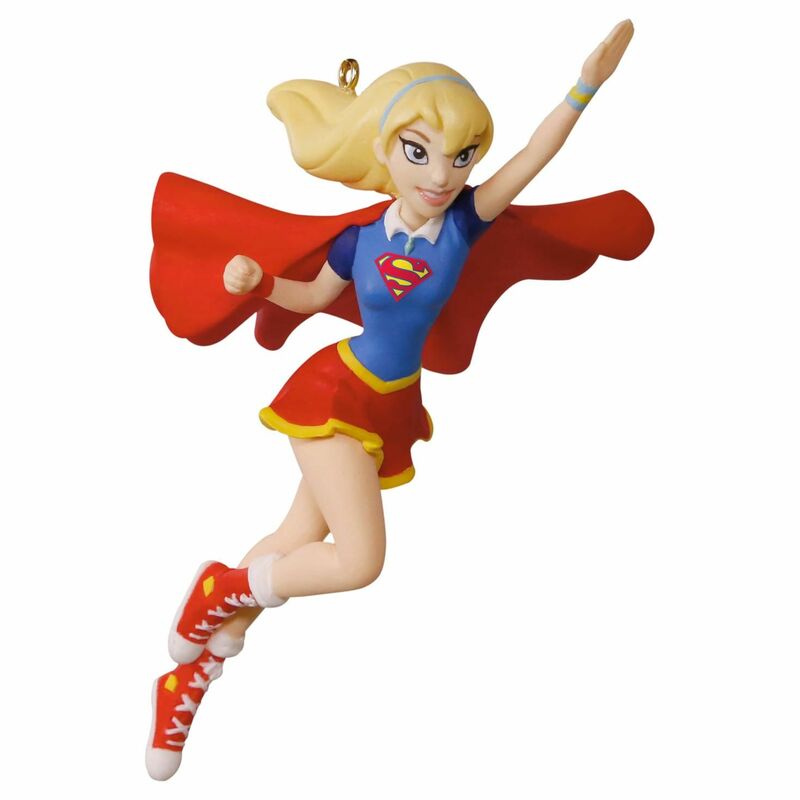 The DC Superhero Girls Supergirl was a collectible Christmas tree Ornament from Hallmark. There are certain items that make me think that a character has 'made it'. One would be a Happy Meal toy (which we got for Supergirl earlier this year). Another would be a Hallmark ornament. I'll be hanging this on my tree this year. It is a gift for myself that I'll open on Christmas Eve. Amazing! But I also saw this the other day! 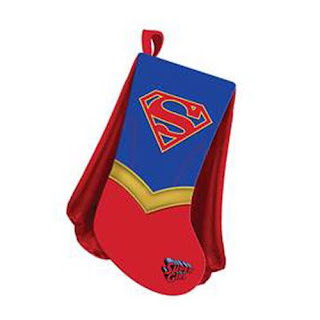 A Supergirl specific Christmas Stocking. I love that is has the specific S-shield and the pointy 'belt' portion and a cape. Brilliant! Merry Christmas and Happy Holidays to everyone! Hope you all have a great time! When the Supergirl television show was first announced, a number of fans (myself included) hoped that Sterling Gates would be tapped to join the writing staff. After all, there were elements of the show that seemed to riff off of Gates' hallowed run with the character (along with superstar artist Jamal Igle). And then when Gates wrote the Adventures of Supergirl digital comic based on the television show, another outcry came up from fandom. Gates seemed to have such a great handle of the characters ... not only this Supergirl but also Winn, Alex, and the rest of the cast. Why wasn't he on the show's writing staff? And then, last week, Gates posted this pic on Twitter. 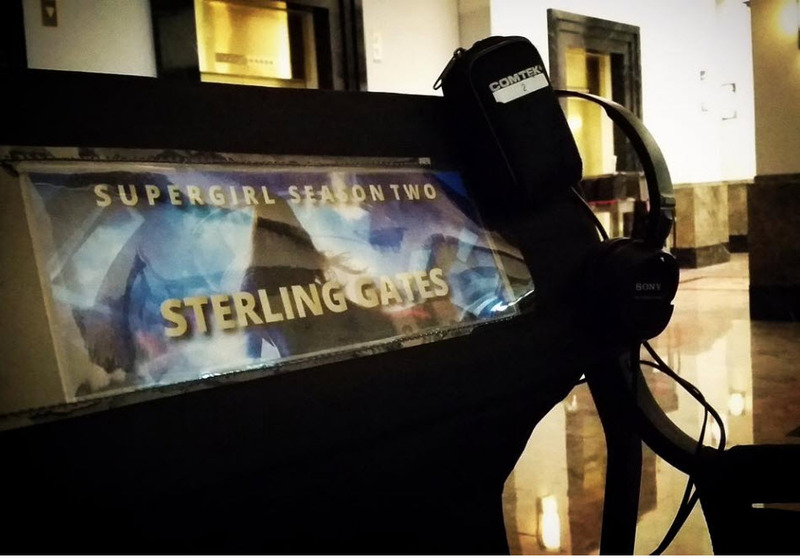 That is clearly a chair with a headset and his name adorned with a Supergirl Season Two banner. He has to be on set. Now the picture was posted without text, so I don't know what he was doing there. But I have to assume he was there as one of the script writers. And if that is true, it couldn't happen to a nicer and better creator. Gates work with the character is appropriately lauded. He deserves to be there. As for me, I have always wanted my name on a director's chair, implying I have some important position. Maybe one day. Superwoman #5 came out last week and was another issue jam-packed with story and character moments. I have said it before. No one gets better mileage out of 20 pages than Phil Jimenez. Between scene changes and inset panels and dialogue/text, each issue of Superwoman has read more like two issues than one, especially in this era of decompressed storytelling. We take a bit of a jump from last issue's end. 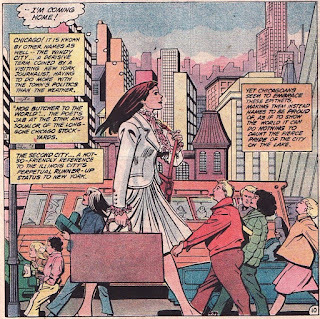 Lena Luthor, as Ultrawoman, has completely taken over Metropolis. Areas of the city are placed in force field boxes with wonky time rules. The Bizarro Women are roaming the streets to shut down resistance. And Superwoman and her group of heroes are trying to strategize what the next steps are. In some ways, that was exhilarating. We were thrown into the chaos and had to scramble a bit to make sense of it. That felt sort of real. In other ways it was confusing. I went back to the end of the prior issue to make sure I hadn't skipped a page. But there is mystery here as Lena's plans aren't completely laid out before us. I don't exactly know what she is trying to do here and that makes her a little scarier. And she has truly become something horrific physically. I used to feel sympathy for her. But there is a twinge of revulsion now. As for Lana, she continues to be a very complex character dealing with visual hallucinations, PTSD, heroism thrust upon her, and hiding all this from her friends. I really feel for her as a character and hope she gets a handle on things. And when I care as a reader, that is the mark of a good writer. Jimenez writes and pencils this issue and the art is fabulous. But I truly love this cover by Ben Oliver. Wonderful image. On to the book. 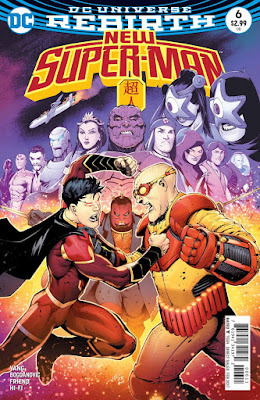 New Super-Man #6 came out last week and was a good closure of this first arc by writer Gene Luen Yang and artist Viktor Bogdanovic. From the very beginning, I have been surprised how entertained I have been by this title. 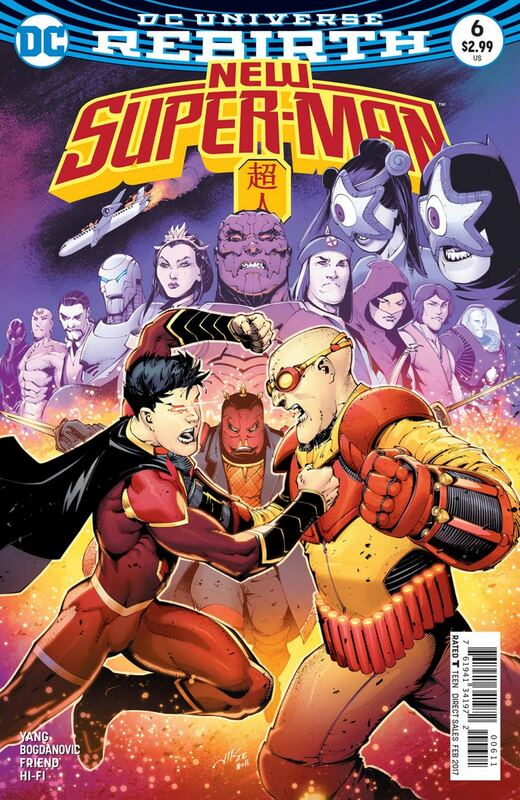 The core of the book is obviously New Super-Man Kenan Kong. Kong is an interesting cauldron of teenage emotions ranging from a bullying oaf to a depressed son to a silly superhero. Kenan is definitely complex enough to make me want to follow more. But Kenan is only the core. This really reads like a Justice League book with Chinese versions of the League members and the Freedom Fighters. It is a fun read seeing how the main character traits of the main DCU heroes while definitely being different enough to feel fresh. And there is more bubbling under the surface. This League is new and unknown. So I like that the Great Ten, the government sponsored superhero team, isn't happy about this new League's existence. And there is the plotline covering the motivations of the Ministry of Self-Reliance and the Freedom Fighters. What is freedom or self-reliance? Action Comics #969 continues the Men of Steel storyline which explores Luthor's role as Superman and what the concept of justice. Writer Dan Jurgens and artist Patch Zircher take us to an alien world where warriors punish criminals before they commit their evil acts. And it is a decent, entertaining read. Whether it is the conversation 'would you kill Hitler as a baby?' or Minority Report, the idea of pre-emptive justice has been explored a bit. But I don't think I have necessarily seen it in a Superman comic. I am also reminded of the mostly plodding 'Trial of Superman' arc in the 90s where Superman was put on trial for a crime he didn't commit, taking the blame for his race's actions in the past. Luthor here is being charged with becoming Darkseid and being a universal threat. This is a heavy charge, one Luthor denies he would ever do. But the question remains, would you kill Luthor to stop the murder or enslavement of billions? Even the God-killers, like L'Call, give pause. It is interesting to see Luthor acting as Superman here, pointing to the S-shield as a defense, and wondering why he is being hunted down for something he hadn't done. Irony! As usual, Zircher brings a lot to the table here. 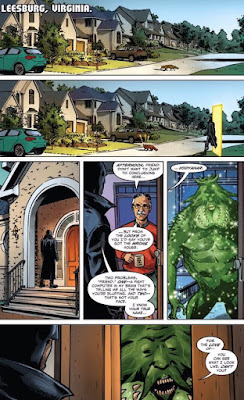 From pacing of panels to point of view angles, Zircher is one of those artists whose work I try to dissect, trying to intuit what he was trying to say with the art. U know 'decent, entertaining read' is damning with faint praise. Trust me, this is a good book and this plot is fascinating. Supergirl #4 came out this week and was a very good issue, pushing the story along nicely and throwing in a lot of emotional beats. It is these character moments that make this such an enjoyable read, possibly the best issue of the title so far. The underlying premise is that there is a war going on for dominance over Supergirl's spirit. Is she still beholden to Kryptonian culture so much that she would sacrifice Earth to regain it? Or has she put the scars and sadness of Krypton's death behind her and embraced her new home. It is unfortunate that we are mining this theme again. 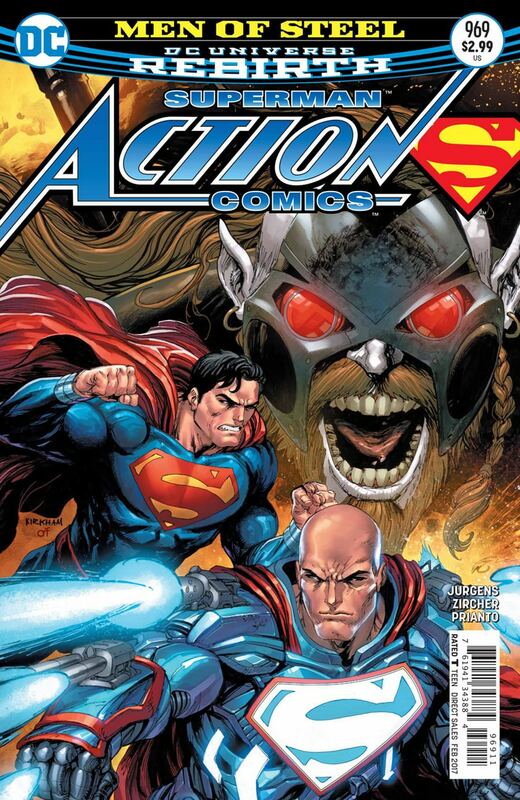 It has been played out in New Krypton, the beginning arcs of the New 52, and the ending arc of the New 52. But since #Rebirth might be the first Supergirl comic someone has read, I suppose it makes for a good opening arc, differentiating Kara's origins from Superman. She would miss Krypton; she actually lived there. Writer Steve Orlando even has a nifty way of playing this theme out, having Kara's parents in conflict, a way of making the Earth/Krypton emotional fight also a very physical one. We saw the sets of parents interact in the Silver Age but I don't think that has been used recently, bring a fresh feel to the overall plot. If there is one thing that detracted from this issue, it would be the art ... in places. Brian Ching has a distinct style and some panels of his expressive work are really wonderful. But there is also an unfinished feel to his work in places, particularly in his leaving of faces, noses, and mouths occasionally. Also, it was in this issue that I finally noticed that Eliza is missing a hand, something I may have noticed before if my eyes didn't gloss over things as Ching's artistic shorthand. This isn't a blanket complaint; most of the issue is beautiful. I freely admit that I am a 'Wednesday Warrior', one of those people who is in the comic store every week, picking up my monthlies which have been pulled from the rack for me. I'm on a first name basis with the staff at the store who knows what comics I like and recommend things to me. I also know I am a dinosaur. I know that the death knell of comics has been ringing for decades. And I am not a doomsayer. But this months sales discussion over on ICv2 was a bit interesting for me. Actual comic sales were down significantly in comparison to last November - 12.7%!. That said, trade sales were up 25% from the year prior. When folks like me complain about 'writing for the trade' and bemoan comics being canceled because monthly sales were low while people 'waited for the trade', this number should be shoved in our faces. Trades is where the money is clearly at. And now onto individual title sales review. I have been moseying in and out of shops lately, doing some in person Christmas shopping. I find it a bit 'old school' to actually be looking on the shelves for something special that is perfect for someone special. And when I don't know what to get someone, online shopping seems weird. Sometimes I just need to look on the shelves and see if something grabs me. 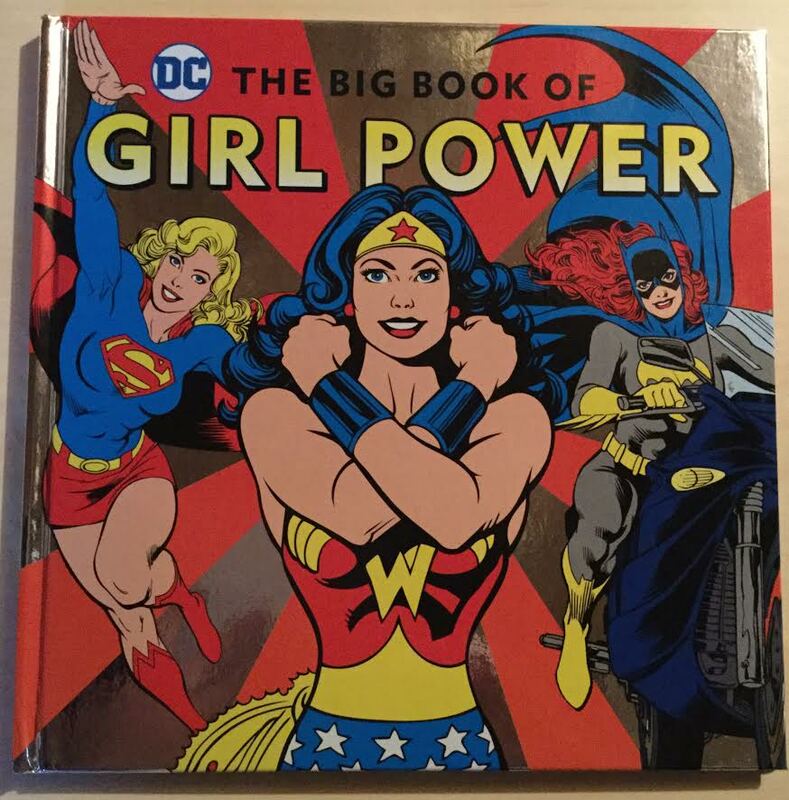 And it was while in a book store that I stumbled on DC The Big Book of Girl Power by Julie Merberg. And, luckily for me, a good friend has young children and I thought this would be a perfect gift. 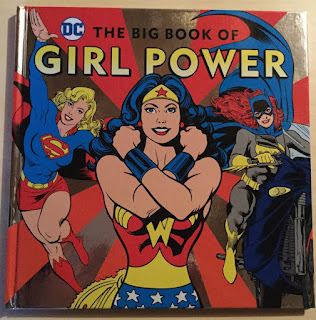 The book itself is a nice look at DC female characters focusing on an aspect of their personality or power and delivering an empowering and uplifting message. Lucky for us, Supergirl is included. And not only that, she gets two pages! Chicago has always been a friendly place for Supergirl. 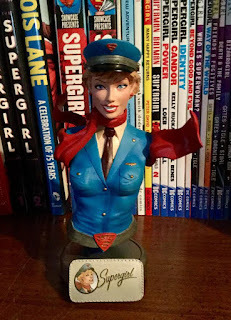 Linda Danvers called The Windy City home in her 80s title Daring New Adventures of Supergirl. 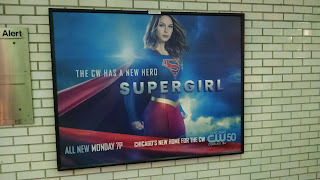 And thanks to blog friend Wayne Allen Sallee I learned that the Chicago on our Earth also loves Supergirl ... or at least her television show. Wayne sent me the media blitz promoting the show in the el stations of the city. I can understand why Wayne forwarded these pictures to me. It is an incredible array of promotional images. It seems as though you couldn't look anywhere without seeing the Girl of Steel. So on the wall you can see a poster reminding people that Supergirl is now on CW. It includes the local station so people in the city know where to turn the dial (I just dated myself with that phrase). And it is a nice big size. Hat tip to my friend Mart Gray who sent me the following page from Midnighter and Apollo. I have never read the book (or the characters) before. 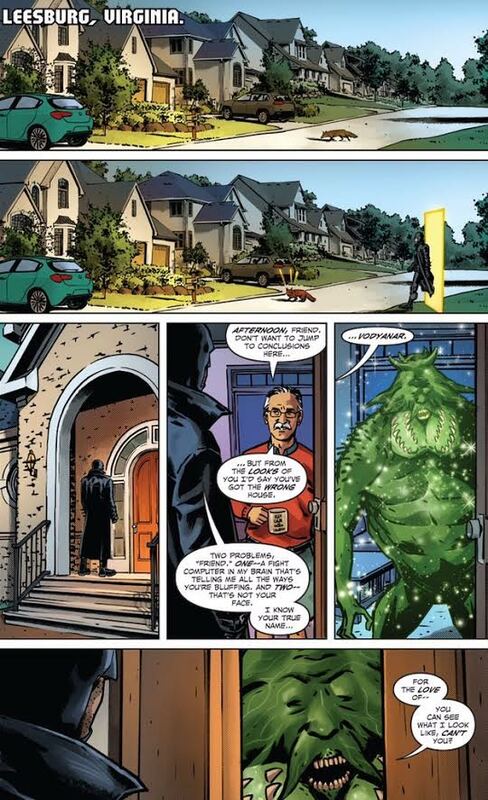 But it appears that Midnighter walks through a magical door and approaches a house where the inhabitant is clearly some sort of mystical being hiding as human. And I don't know about that fox ... but that's has to be something. No one draws a fox crossing a suburban street by chance. But while this was an interesting interaction, this isn't why Mart sent it to me. Did Supergirl fans catch why? One of the good things about twice monthly titles is that you never have to wait too long for the next issue to hit. I have been loving what Peter Tomasi and Patrick Gleason have been doing on the Superman book and so it makes me happy that every other week a new issue is in my hands. And maybe it is because I know that issue turnaround is so quick that I don't quibble as much about pacing or quick reads. When you receive a new chapter in 14 days, you're allowed to take a breather or hit the gas pedal now and then. Superman #12 came out this week and was one of those gas pedal issues. 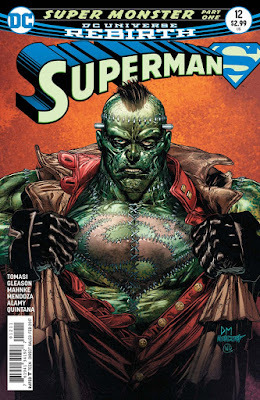 The majority of the story is a fight between Superman and Frankenstein. We don't really get an understanding of why Frankenstein is acting the way he is until the final cliffhanger page. Instead, in large beautiful panels drawn by Doug Mahnke, you witness the brawl between titans. Big panels and high action made this a pretty quick read and sometimes I quibble about that. If I had to wait a long time to get the progression of the story I might think that the fight could have been pages shorter and therefore the story could move along. But knowing the next issue is now just 12 days away, I allowed myself the joy of just seeing an old-fashioned donnybrook, all delivered to my eyes beautifully. Maybe I need to stop and smell the comic roses now and then? One of the running themes in this season of Supergirl has been the fear of aliens and reactions to that fear. When the President recommends alien amnesty, there is some push back. Lillian Luthor and Cadmus whole purpose is the rid Earth of all aliens. That sort of blanket statement ... 'All Aliens are Bad' ... is clear prejudice. Sure there are evil aliens. But most are just trying to live their lives. Of course, this is also commentary on our current world. When 'Not all ____' and #BlackLivesMatter and the attitudes of thecurrent political landscape all scream division rather than unity, we need to have re-assess things. And so allegories that spur conversation can help people wrap their heads around the concept of equality. And with that in mind, I thought it would be a good time to review Adventure Comics #411, a story which explores this very issue. It amazes me that an issue from 1971 could be so timely for our 2016 world. It feels as if not much has changed in 45 years. In fact, some of the panels are eerie. "The Alien Among Us" was written by John Albano with luscious art by Bob Oksner. And like many stories from this period, it moves along at a very brisk pace. We open with Linda Danvers at her job as news camera operator. Her crew hears that an alien seems to be falling to Earth. Realizing that this could be a job for Supergirl, Linda clocks out and rushes off. 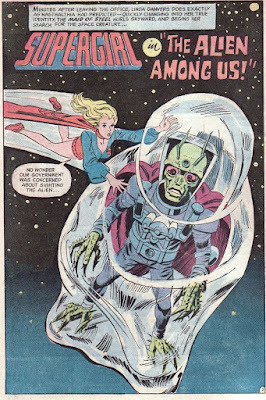 And above the Earth, Supergirl discovers that yes indeed an alien is plummeting to the planet. The alien is definitely odd looking with gnarled hands and feet, antennae, and odd suit. Who is he? Why is he here? 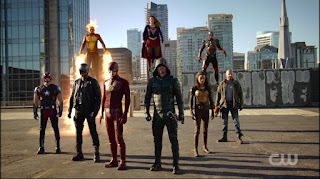 Last week was the Invasion crossover of the the four CW DC shows and I have to say it was pretty entertaining. There were plenty of tiny flourishes for old school comic fans. There was a feeling of 'my god I'm watching a Justice League live action show'. Each chapter did a good job of both pushing the story along while staying true to their individual show's character and style. It certainly wasn't without its story flaws. There were plot twists that seemed forced. The ending seemed a bit rushed. Maybe there was a little bit too much angst. There were things that happened which I meta-textually explained away as scheduling issues and budget constraints. But I am going to be honest here. In the end we saw a bunch of super-heroes fighting a bunch of Dominators. I got to see minor characters from my comic childhood on the small screen interacting with each other. And Supergirl played an important part. How can I not be thrilled! Giddy! Look at the picture at the top of this post. What world am I living in when this is something that actually happened. It wasn't perfect. But it was and it was a ton of fun. I'll try to do a relatively brief review, highlighting the parts I loved, probably focusing on Supergirl too much. But settle in because I'm going to try to review the last three parts in one post. At the very least, enjoy the pretty pictures. 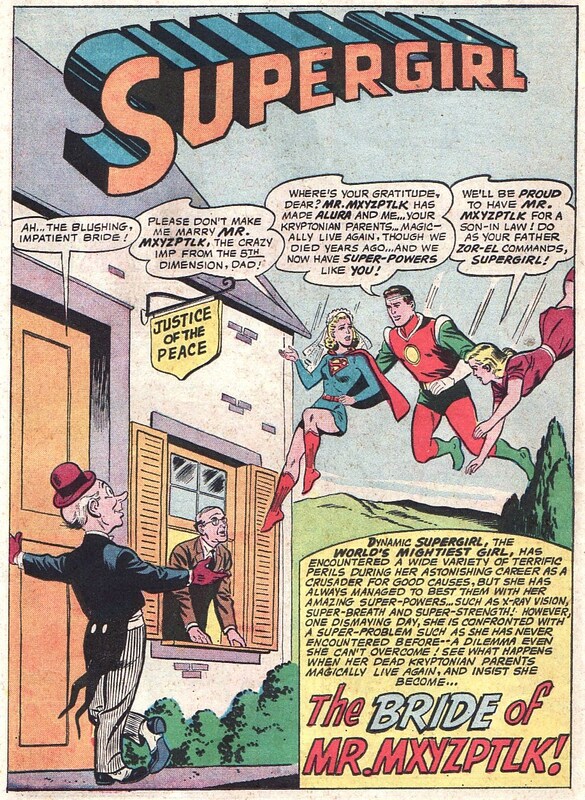 The news came out recently that everyone's favorite 5th dimensional imp, Mr. Mxyzptlk, is coming to the Supergirl show! While the show does seem to be leaning on Superman's rogues gallery for the villains of the episodes, I don't have too much to complain about here. 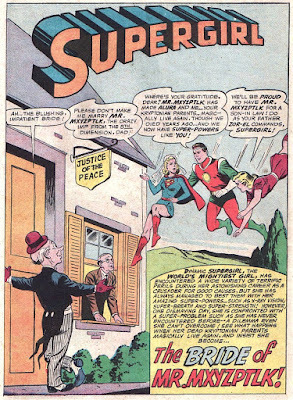 Mr. Mxyzptlk has a relatively deep history with Supergirl, especially in the Silver Age. He was responsible for giving Kara her powers back (and a temporary immunity to Kryptonite!) early in her Action Comics run. But Supergirl hadn't been revealed at that point; Mxy thought she was just a 'normal girl'. He bothered her in the Adventure Comics run. And he was the big bad in Supergirl:Cosmic Adventures in the Eighth Grade. But I thought it would be appropriate to review his first true battle with Supergirl, Action Comics #291! The cover comment for the Supergirl story is that she meets her Kryptonian parents and that is true. But it is in the context of the story 'The Bride of Mr. Mxyzptlk!'. Written by Jerry Siegel with art by Jim Mooney, the story is a wild romp stuffed into 12 pages. I am always amazed at just how much the old creators could put into a back-up feature! This would be a 6 parter these days. And it opens up with this fantastic splash page. There is Mxyzptlk, looking dapper in his day tuxedo (while maintaining the purple derby and gloves), waiting outside the Justice of the Peace. And there is Kara, in a veil, being brought to the celebration by her Kryptonian parents. Say, aren't they dead? Despite Kara's protests, they are forcing her to marry the 5th dimensional trickster. Whew ... there is a lot to digest in this one picture! But does the story hold up to this opening hook? Last week I went to the comic store and was delighted to find a nice surprise. 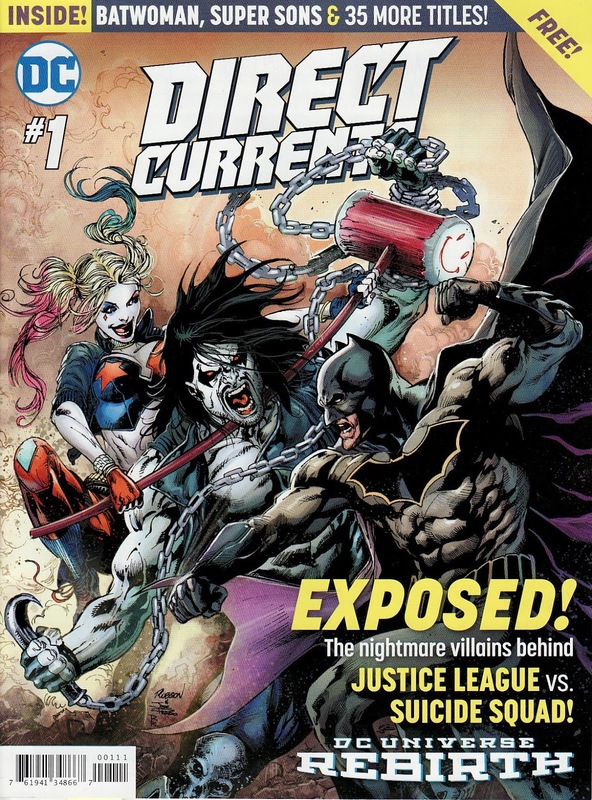 Direct Currents #1 was on the rack, a promotional magazine put out by DC Comics, big and glossy and covering all of the titles in some fashion. And best of all it was free. 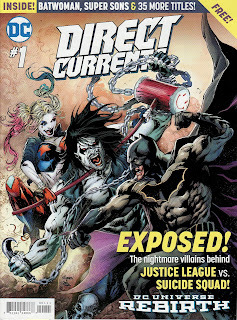 I remember the pre-internet days of Direct Currents being present in DC Comics, basically a list of the upcoming title solicits. And I also like the Daily Planet faux newspapers, the occasional DC Profile of creators, and even the straight up news columns that occasionally would grace DC's books in the 70s and 80s. So the name and format struck a nostalgic chord. But more importantly, it's in print! I guess I am going to sound like a Luddite but I like the print format. I picked this up looking forward to reading about the super-titles. But I read about the Suicide Squad and the Flash books as well. I'll probably end up reading this cover to cover. Because while I was sipping my coffee it was easy to simply flip the page. I don't think I would necessarily have clicked on an article about, for example, The Flash. I certainly wouldn't have done it on sites where you need to click through ads, slides, etc. So thank you DC! I am hoping that the #1 on the cover means this might be a recurring thing. The book opens up with a letter from Dan Didio. He starts out talking about the JL/Suicide Squad crossover. He touches on the upcoming Batwoman and Super-Sons titles. And he ends the missive by saying "Rebirth is about a voice, a tone, a sensibility. We're crafting a strong, cohesive universe." I rolled my eyes. I suppose some might derisively snicker. Didio was in charge for the years were things were off-tone and insensible. Hard to take him seriously. I will say I have been happy with the post-Rebirth DCU. And I liked that he mentioned Mr. Oz and said that story is coming to the forefront soon. There is a nice article about the Superman books in which we hear how Dan Jurgens, Peter Tomasi, and Patrick Gleason work together to get the long form stories right. It is worth reading. And Supergirl gets just a strip of one page (three columns on the page promote Supergirl, New Superman, and Superwoman). It is a brief and to the point. The middle section lays out the foundation of the book and defines the DEO. 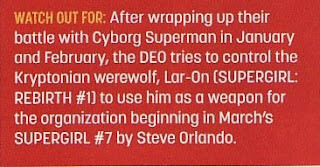 But the last paragraph does give us our first glimpse into what will happen after the Cyborg Superman. Looks like the DEO is going to try to weaponize Lar-On! It will be interesting to see how this plays out. Supergirl promised Lar-On that she would be there to help him. Will she support this? What if Lar-On doesn't want to do this? Will Supergirl side with him? He might ask her to kill him, given his curse. What will she do then? I'm glad Orlando is bringing him back. I wasn't too keen on the idea of him just lying in the DEO sedated. Anyways, head to the LCS and pick this up. It's free! And I'll let you know if this Direct Currents leads me to buying a new title, the ultimate goal of something like this! Superman Annual #1 came out this week, done by the Superman title's main creative team Peter Tomasi, Patrick Gleason, and artist Jorge Jimenez. It is hard for me to wrap my head around the book. In the end I think it will get a high grade on review. There are plenty of high points. The art is probably the biggest hook for the issue. This is a new sort of book for Jimenez who brings big splash pages, double splash pages, innovative page designs, and delightfully trippy images to really make it visually pleasing. Tomasi and Gleason answer an early mystery from their run. 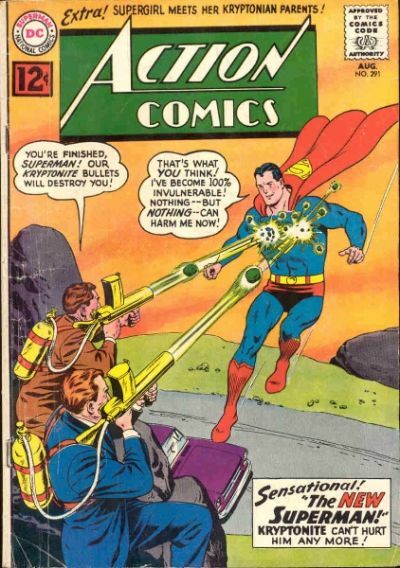 They pile on some intrigue about whatever the underlying enigma of Superman's origins here. And they add a nice sentiment about the fact that this is a new world for this Kal-El. 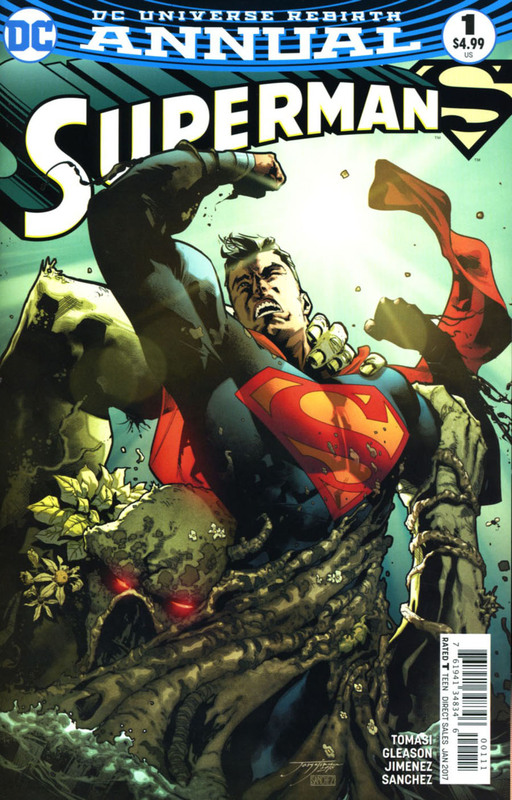 They also have this act like a DC Comics Presents issue, teaming up Superman with Swamp Thing. The new DCU is still too fresh for me to know exactly what the history is between these two. 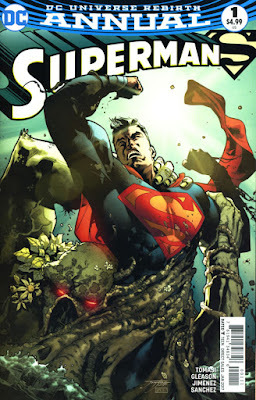 The New 52 Superman (I think) knew Swamp Thing. But does this Convergence Kal know him? But it is hard to link the original threat that spurs Superman into action to all the good plot progression that it brings. This feels like a sort of forced team-up. Still, the art alone makes this an issue to look for. And I liked the ending and what it was trying to say. On to the book! It is an early Christmas for me. 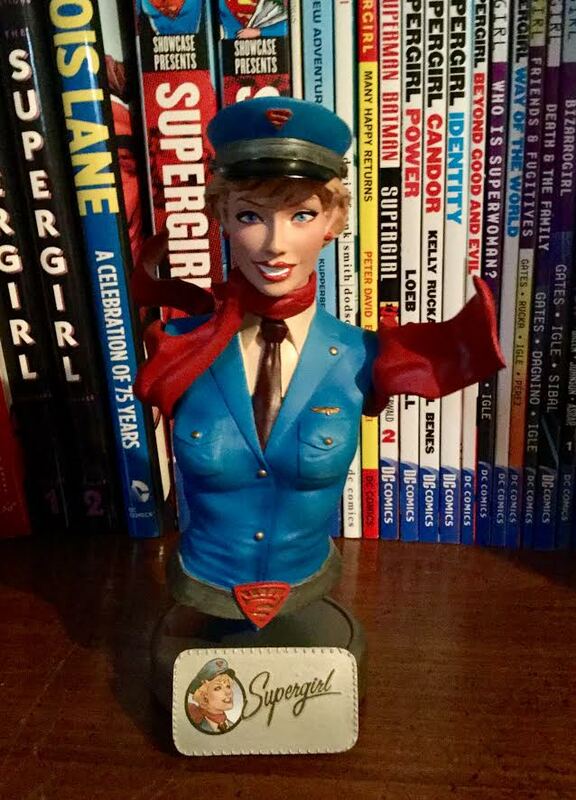 Last week the DC Bombshells Supergirl bust arrived at my local comic store. I had been slowly paying this off over the last several months so the financial bite was lessened by time. 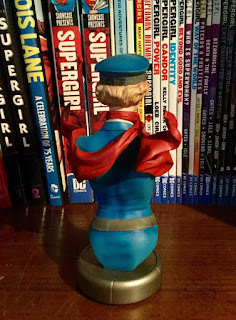 Also, I was thrilled that this was marketed as I can feel okay displaying this, more than the bustier wearing Bombshell Supergirl statues that have been marketed. This is just a great bust. I love the formal dress uniform look for Kara here, especially the S-shield cap and tie look. I also like the dynamic nature of the scarf, replacing the cape here. I also think Supergirl's face is quite lovely here. That smile is fantastic. And the back is nicely detailed as well. I like the details in the hair and the wrinkles in the jacket and cap. I also love the folds and swooshes of the scarf as well. This could have been a simple design but the sculptor gave the cape some volume and action. I love it. No pun intended, but the biggest thing about this bust is it's size. It is big! 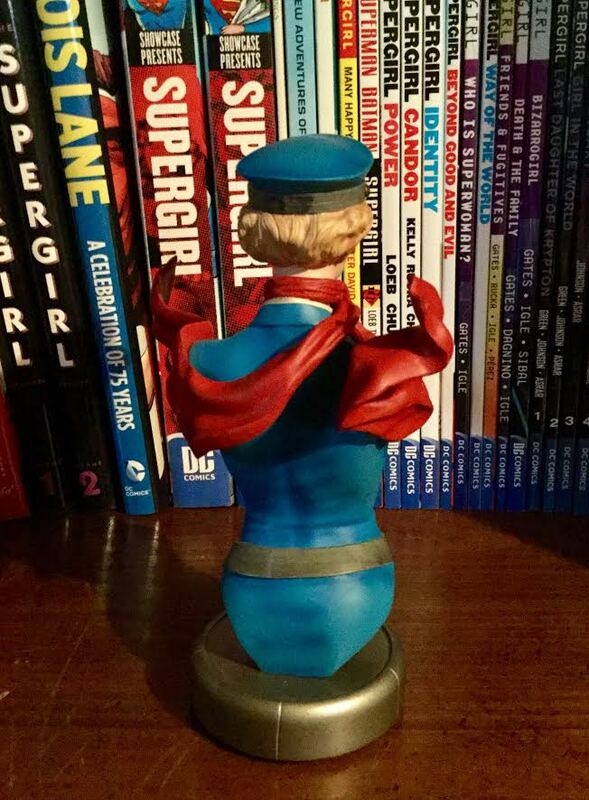 Look at how it sort of dwarfs the other Supergirl busts that are out there. it definitely is worth the price when you factor that in. This is a lousy shot of its space on my shelf but I added it here. 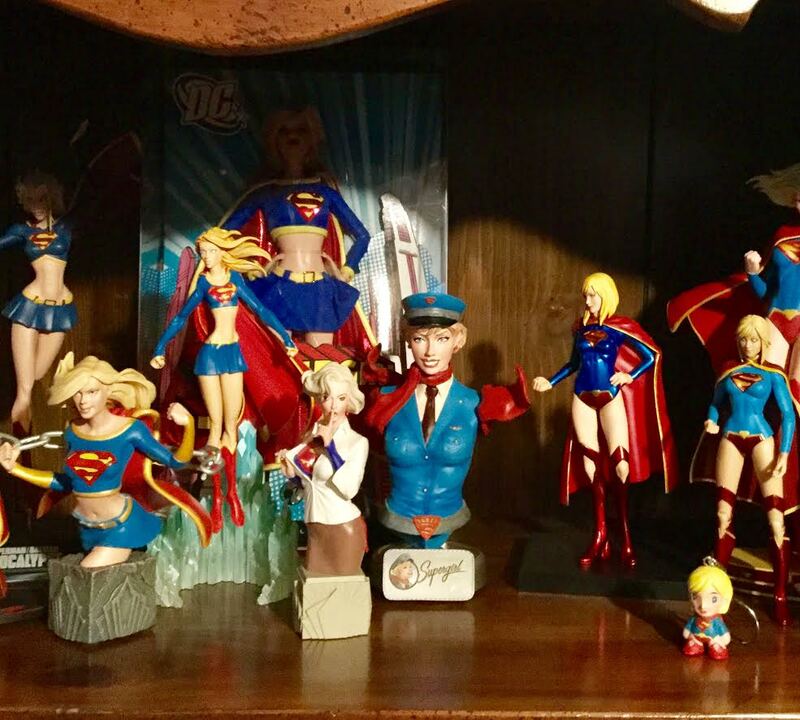 This shelf showcases the most recent costumes Supergirl has worn and so I think it was appropriate to place here. After Christmas I promise I'll do a post showing the whole collection.